A Grilled Cheese Sandwich is a cheese sandwich that is fried in a frying pan or on a griddle. In colloquial usage, it is just called a Grilled Cheese, dropping off the “sandwich” part. The term can be confusing. It is not a sandwich that has in it cheese which has been grilled, but rather it is a cheese sandwich that is grilled: the whole sandwich is grilled, not just the cheese. And, the sandwich is not actually “grilled” — the term grilled there is partly an anachronism from the sandwich’s evolution, and partly from today’s confusion in the American mind over what a “grill” versus a “griddle” is (see the entry on Grill.) Grilled Cheese Sandwiches really should be called “fried cheese sandwiches” or “griddled cheese sandwiches” — but it’s far too late to try make the correction now. There are only three ingredients in a Grilled Cheese Sandwich: bread, cheese and butter (or margarine.) The goal is to brown the outsides of the sandwich, and melt the cheese inside. The outsides of the sandwich are buttered, not the insides. You butter two slices of bread on one of their sides only. Place one slice buttered-face down in a heated pan, and put the cheese on top of it. Put on the remaining sliced, buttered side up. After a few minutes, use a flipper to check on the sandwich. When the bottom side is browned, flip to brown the top side. When ready, the outside should be evenly golden-brown and crispy, and the cheese inside melted. Some people add oil to the pan, some butter. Some add no fat, especially if they are using a non-stick pan. The pan must be hot first, or you’ll never get the right colour. But, the heat can’t be too high, or bread will start to burn before the cheese melts. Some people like to cover the pan to keep heat in to help the cheese melt. The bread normally used is sliced American white bread. You can experiment with the cheese. While most people expect cheddar, you could use Colby, Gruyère, Swiss, Havarti, etc. Some people use grated cheese, but the norm is cheese slices and particularly, processed American cheese slices as they melt the best for the sandwich. You can also use a cheese spread such as Cheez Whiz. Some people like to added thinly sliced tomato or onion in the middle. The question is always how far can you change the sandwich before it stops being a Grilled Cheese Sandwich. Some like to add a slice of ham in the middle — but that makes it a Croque Monsieur, even if they’ve never heard that term. Some people like their Grilled Cheese to be as flat and dense as possible. The accomplish this either by press down on the sandwich with the flipper while it is cooking, or by putting a weight such as a bacon press on it, or by making it in a sandwich press. Others don’t like the idea of a pressed-down, “mooshed” Grilled Cheese. Some like to cut the finished sandwich in half diagonally; some like to cut it in half straight through the middle. The classic accompaniment is tomato soup at home, or perhaps French fries at a restaurant. Many like to dip each bite of their sandwich in ketchup. It is very hard to wrap a Grilled Cheese Sandwich for takeout, because any wrapping at all seems to trap the steam and cause the toasted bread to lose its crispiness. A Grilled Cheese Sandwich is not the same as cheese on toast. To most people, a toasted cheese sandwich would be what the British call “cheese on toast” — an open face sandwich made with a single piece of bread, cooked, under the grill / aka broiler. Cooked cheese and bread combinations have been around for as long as bread and cheese have been. Alan Davidson, in his “Oxford Companion to Food” (Oxford University Press:Oxford. 1999 pp. 796-7), says that melted cheese appeared as a topping on toast by the end of the 1500s. And, in Paris, by 1910 Croque Monsieurs — a grilled cheese with a ham slice in it — were being made. Sandwiches called “Grilled Cheese” appeared on the American scene in the 1920s. That, coincidentally, is when both sliced bread and affordable domestic American cheese were readily available — though the cheese didn’t come already sliced at the time. The Monte Cristo sandwich, another fried sandwich with cheese in it, can be dated for certain back to 1923. Before then, the sandwich was likely to be called “toasted cheese.” It could be cooked by broiling, baking or frying, and was most likely to be open-faced, and for all intents and purposes, really just have been Welsh Rabbit by another name. Even when the term popped onto the scene, interpretations of what should be called a Grilled Cheese continued to vary a great deal. The sandwich could be open-faced, it could be broiled cheese on toast, it could be a cheese sauce on toast broiled. “Well, Mrs. Newlywed, there are a number of things that can be prepared at table on a grill ….. Dishes that may be prepared on an Electric Grill: All types of hot sandwiches such as grilled cheese, tongue and egg, club, sardine, etc.” — Carey, Nancy. Hot Sandwiches and Creamed Dishes Cooked on a Grill. Syracuse, New York: Syracuse Herald. 22 April 1929. Page 18. “The Camp Fire Girls and Girl Scouts are being educated into all the fine points of camp life. They are taught to cook many kinds of food (which the old camper fried) on the end of a green stick over a fire. Bread may be toasted ….by means of a sharpened green stick and a good fire. Did you ever try…. Grilled Cheese Sandwiches. — Spread bread with butter and place a thin slice of cheese between two slices. Either toast, or saute in a little bacon fat over the fire in a frying pan.” — Camp Cooking in “The Kitchen Cabinet Column.”. Nashua, Iowa: The Nashua Reporter. 17 July 1929. Page 9. “Grilled cheese sandwiches are delightful when made in the open. Lay large, thin slices of cheese between two slices of buttered bread. Either toast these on the end of a green stick or a gridiron or saute them in bacon fat in a saucepan. Those who take long hikes will be interested to know that if cheese is wrapped in a cloth moistened with vinegar, it will not mold so quickly.” — Galveston Daily News. Auto Lunches for the Week-End Trip. Galveston, Texas. 7 June 1930. Page 14. 10 February 1939. Page 13. “Luncheon: Grilled Cheese Sandwich, hot. 250 [calories].” — Kain, Ida Jean. Your Figure, Madame! Syracuse, New York: The Syracuse Herald. 4 October 1930. Page 33. “Go to Galleher’s, Fifth and Chillicothe Street. Fountain Special Saturday Only. Try our inner toasted sandwich American Creamed Cheese or Baconed Grilled Cheese with iced orangeade. 25 cents.” — ad in The Portsmouth Times, Portsmouth, Ohio. 31 July 1931. Page 14. “Walgreen’s Crawford and Madison. Grand Reopening Sale. Malted Milk and Grilled Cheese Sandwich. 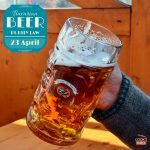 25 cents from 2 PM to 5 PM.” — ad in The Garfieldian. Chicago, Illinois. 31 January 1935. Page 6. “Shoppers Lunch: Grilled Cheese Sandwich / Hot Chocolate / Home Made Cake. 25 cents.” — Walgreen’s Advertisement in Waterloo Daily Courier, Iowa. 12 November 1936. Page 22. “Auerbach’s Air-Cooled Fountain. Wednesday Afternoon Specials— 2:30 to 5:30 Only. Grilled Pimento Cheese Sandwich, Potato Salad, Root Beer or Coffee, Royal Gelatin or Home-Made Ice Cream. 15 cents.” — Advertisement in Salt Lake Tribune, Utah. 12 August 1936. Page 12. “Grilled Cheese and Bacon Sandwiches with Hot Tomato Sauce / Celery Hearts, Pickles and Olives / Coffee, Tea or Milk (For hot tomato sauce, just use condensed tomato soup as it comes from the can, heated. Delicious! )” — Sunday Night Supper Menus. Middletown Times Herald. Middletown, New York. 14 January 1938. Page 10. 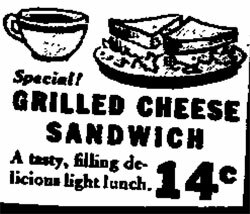 “Soda Fountain: Grilled Bacon and Cheese Toasted SANDWICH and COFFEE both for 21 cents.” — Advertisement for Liggett’s Drug Store in Chester Times, Pennsylvania. 2 February 1939. Page 7. “Towne Tavern Luncheon Specials: Grilled Cheese Sandwich / Potato Chips / Cole Slaw / Drink. 20c” — ad in Portsmouth Times. Portsmouth, Ohio. 1 December 1939. Page 12. “Grilled cheese sandwiches are nice, but you’d be surprised at the amount of difference added to the taste if halved walnuts are pressed into the cheese while the sandwich is warm. It’s decidedly an improvement.” — Stern, Aline. Home-Making. Huntingdon, Pennsylvania: Daily News. 21 February 1934. P. 7. “Miriam Lowenberg, of the Foods and Nutrition Department at Iowa State, has a special grilled cheese sandwich that goes straight to the heart. She spreads whole cream cheese on unbuttered bread, adds a bit of prepared mustard to which a drop of Worcestershire sauce has been added, then — and this is what makes it different — she butters the outside of the sandwich lightly and toasts it in the broiler oven, or browns it quickly in a heavy skillet.” — For the Homemaker column. Milford, Iowa: The Milford Mail. 25 January 1934. Page 2.
bread. Butter the outside of the bread and toast under a low flame until golden brown.” — Cheese Dishes to serve in Lent. Hammond Times. Hammond, Indiana. 6 March 1936. Page 7. Kraft introduced cheese sold in individual slices in 1950, which soon became the standard cheese to use. By the 1960s, a top slice had definitely become the standard, along with frying the sandwich on a griddle or frying pan. Franke, Sharon. How to Make the Best Grilled Cheese Ever. Good Housekeeping Magazine. 25 February 2011. Ozersky, Josh. Grilled Cheese Should Be Made by Moms, Not Restaurants. Time Magazine. 3 August 2011.